Date: 27 April @ 4:60 p.m.
Who: Dr Japie van Zyl, previous Director of the Solar System Exploration at NASA and currently with HydroSAT, as head of the InSight Mission. 21 April; 18 May – booking essential! 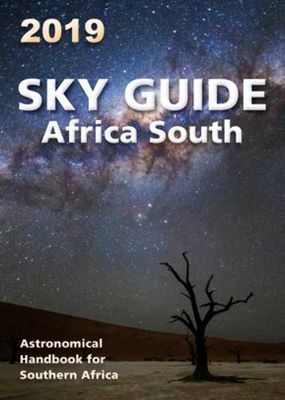 The Sky Guide is the astronomical handbook for southern Africa, and is an invaluable practical resource for anyone who has even a passing interest in the night skies of southern Africa. Prepared yearly by the Astronomical Society of Southern Africa as a reference work for the novice, amateur and professional astronomer, it continues the tradition of the well-established Astronomical Handbook for Southern Africa. It presents a wealth of information about the Sun, Moon, planets, comets, meteors and bright stars in a clear and accessible way, accompanied by a number of diagrams to support the text. Shows will be listed when we receive confirmation from the presenters. Show dates will be posted subject to confirmation of soccer fixtures. We do not schedule shows when there is a clash with a match played at the stadium next door. Sat 27 April 10:30 a.m.
For the full show schedule please click HERE. Tickets available 30min. before start of show at the door, or , strictly no entry after start of the show. 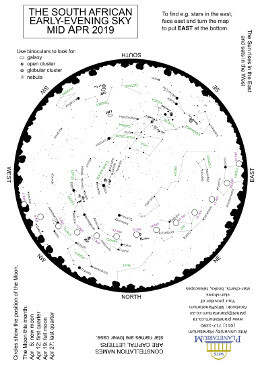 Star charts produced by Dr. Claire Flanagan.